The weather is getting cooler, the nights are getting longer and soon monsters will come to your door begging for candy or treats. No, it's not the beginning of a fantasy short story. Halloween is just over yonder, you can make it out over the haunted house decorations and pumpkins. First: Most people love Christmas or prefer Thanksgiving. Not me. I adore Halloween. There's just something about frightening the crap out of people (or scaring kids for life) that makes me giddy with excitement. Halloween also signals the beginning of winter and I cherish winter. The cold air, hot chocolate, and crystal-like snow amke me giddy with joy. Back to Halloween though. I am fond of all things morbid or creepy. Skeletons, the Grim Reaper, black cats, ghosts, ghouls, spiders, witches, vampires, pumpkins, and other dark things make me squeal with delight. It is the only time of the year where my loosely Gothic wardrobe won't be mocked. It is the only time of the year where people won't look at me as if I'm insane when I mention something about zombies or wanting to buy a bag of rats. 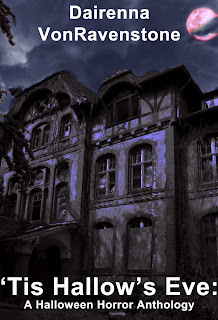 I know some will ask me: "What's with the ominous house?" Well, it IS a Halloween Anthology. 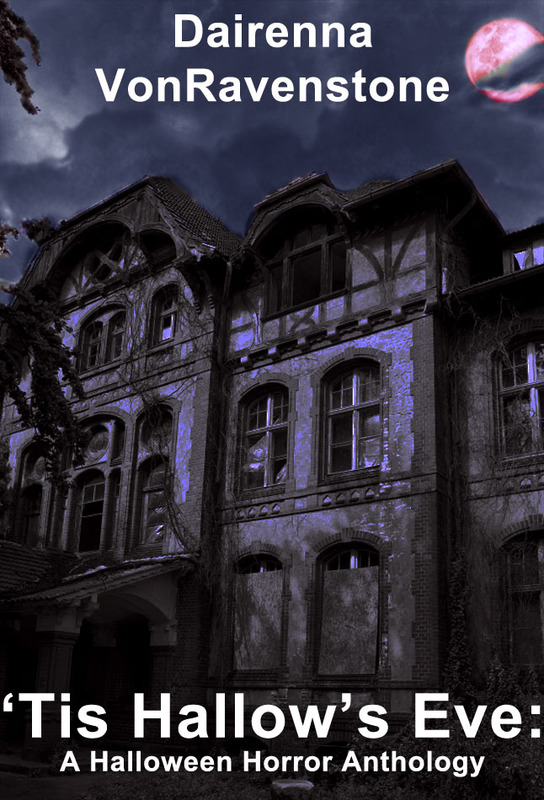 And what Halloween Anthology would be complete without a story about a haunted house? And yes, the moon is reddish for effect purposes only. Though I have to admit Tricky Treats ends on a happy note and allows you to heave a sigh of relief. I did enjoy writing it since it was something I used to do on Halloween with friends. Scaring people is fun. A forewarning on Magic: it may be a little upsetting for some. It really doesn't have much to do with Halloween except that the events occurred on Oct. 31st. I could technically expand it into novel length but that would add more to my over-filled plate. Speaking of my over-flowing plate, I'm partaking in National Novel Writing Month which starts on Nov. 1. Do I have a new plot to write? Nope. Do I have any inclination to write one of my pre-planned (but not yet scribed) ideas? Negative. Am I going to have an idea by the end of the month? All signs are pointing to "no." This is going to make NaNoWriMo interesting, more so since I plan to put out my fourth short story anthology sometime next month. Yes I am insane. No I will not go with you and the men holding the white jacket. White is not my color. A final mention goes out to my BFF Sharon because she's not having a good month and one of the stories in 'Tis Hallow's Eve was inspired by her. Speaking of, look below for a sneak preview. Until next time, try to stay out of trouble and never take candy from strangers. Unless of course, it's Halloween night. Then it is perfect acceptable (even encouraged) to take treats from people you don't know. They had been 13 then and their parents had said they were too old for trick or treating. So Andy (the werewolf) made The Plan. They told their parents they were going to a friend’s house to watch movies but in actuality, they stalked little kids to steal their candy. Half-way through the night they were forced to stop because they could not physically carry any more candy. “Ready?” Andy the werewolf asked. The two made their way from the bushes and darted across two adjoining back lawns, hopping a small fence in the process. No one watched the back of their homes with all the distractions that came from the front. The clown shivered once they made it behind a big oak tree and looked back. A flash of white darted away at the last possible moment and the clown gasped. “What?” Andy grunted without turning to his sibling. “I saw something,” the clown revealed. “Yeah right, probably just your reflection,” Andy groused. “No, I swear!” the clown protested. “Shut up, Roger,” Andy the werewolf whispered back and pointed to a Darth Vader with a Ninja Turtle, and a ninja. “But,” Roger the clown attempted. “Just quiet okay? Those kids are perfect,” Andy growled out. Roger heaved a sigh and glanced back behind him. He scanned the bushes they had just left and saw it again: a white face with black rimmed, glowing yellow eyes was staring at them. Before he could turn Andy to look, it was gone. Roger swore it scuttled away on more than four limbs but decided against telling his brother. “C’mon, they’re going to pass in front of those bushes soon,” Andy broke into Roger’s thoughts and darted towards the line of bushes along the side-walk. “Right,” Roger stuttered out and followed his more agile twin. Andy leaped out of the bushes behind the trio a moment later with a howl of fury. The kids squealed and started to run from Andy as Roger leaped in front of them with a cackle. This made the trio drop their bags and run for the other side of the street. The brothers snagged the three bags and disappeared back into the bushes. “That was awesome,” Andy panted out with a chuckle. Howling seemed to tire him out but Roger knew his brother could do this all night. Roger did not say a word as he dumped one of the three bags into his black pillow case. Andy tilted his werewolf’s head to a side and watched his brother’s sullen movements. “Something was watching us,” Roger told him. “Right,” Andy grumbled and stuffed the other two bags of candy into his own pillow case. “I’m serious!” Roger insisted while waving his hands to emphasize his point. Andy only shook his head and hefted up his own bag. Roger huffed and followed his brother out of the bushes and down the sidewalk. The area was getting deserted as they walked for a while in silence. Andy was looking for hiding spots as Roger mentally whinged about his twin. “Over here,” Andy whispered as he pulled Roger behind a tree. Both boys turned to find the source of the sound but there was nothing but darkness around them. Roger gulped as Andy peered into the trees branches. Nothing was there. Andy kicked the tree then glanced around it, looking again for the three younger girls he had seen a moment before.